Women Talking is an imagined response to these real events. Eight women, all illiterate, without any knowledge of the world outside their colony and unable even to speak the language of the country they live in, meet secretly in a hayloft with the intention of making a decision about how to protect themselves and their daughters from future harm. They have two days to make a plan, while the men of the colony are away in the city attempting to raise enough money to bail out the rapists (not ghosts as it turns out but local men) and bring them home. How should we live? How should we love? How should we treat one another? How should we organise our societies? These are questions the women in Women Talking ask one another-and Miriam Toews makes them the questions we must all ask ourselves. Women Talking is going to be a book that I think about and ponder over for a long time. There was so much to take in and consider. This is a work of fiction, but is inspired by a true story, which is heart-wrenching. What happened to these women is horrifying and truly disgusting. This will not be a book for everyone because the subject matter is very difficult. I thought that it was handled in a respectful and authentic way and I love that it gives victims a voice. The story is told in a way that is original and it took some getting used. The narrator is a man who has been asked to take minutes and record the meeting between the women in this Mennonite community who are deciding whether they should stay and fight or leave. He has been asked to help the women as they were never taught how to read or write. 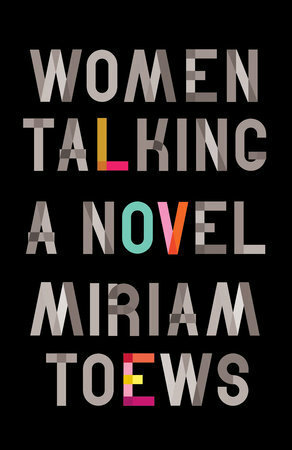 I was not sure how I was going to feel about the narrator being a man when this is a story about women and their voices, but Mariam Toews makes it works and I actually think that it was effective. While there were moments where I wished that the story was being told from the perspective of one of the women involved, I actually think it was a smart choice to keep the reader at a distance and have them feel like an outsider looking in and simply watching how it all plays out. I liked that each of the women was distinct and had their own personality, voice and opinions. They all felt very authentic, as did their relationships with one another. They raise so many important points throughout their discussions, things I probably would have not considered myself. The conclusion that they come to was fascinating and thoughtful. Women Talking will be a book that I think about for a long time and one that I share with not just the women in my life, but the men as well. It was heart-breaking but also had moments of humour and hope. Thank you to Penguin Random House Canada for sending me a copy of Women Talking in exchange for an honest review. Great review! I was looking at this one at Chapters and wondering about it! Looks like one I need to look at again. Thank you! It is definitely worth looking in to! What perfect timing on your review! I just recently heard about this book and then found out that Miriam Toews will be in my city this week talking about it, so I got tickets to go. It sounds so interesting and real and I can’t wait to read it. I plan to buy it at the event and hopefully get it signed. That is amazing!! I bet she is amazing. It is very real. I am so jealous that you’re going to meet her and get a signed copy! It really us. I can not wait to see what you think about it. It’s a book a want to talk about with people! Thank you! I think it is definitely worth adding to your TBR! This sounds like a rough read but important. Definitely going on the TBR. That is exactly it! I hope you get something out of it like I did!